When to use a Synthetic Long Put Option in the Futures Markets? What is the Risk in Trading a Synthetic Long Put Option? A futures and options trader looking to profit from a decrease in profits but isn't confident enough in the speculation to sell a futures contract or even construct an aggressive commodity option spread may look to a synthetic put. This strategy has nearly identical risk and reward potential as an outright put making it a potentially expensive proposition. However, if the volatility and premium is right it can be a great way to sell a futures contract, while retaining a piece of mind and the ability to easily adjust the position. In early 2007 the Treasury market had found itself caught in a trading range which spanned nearly a month. The lack of direction successfully imploded option premiums associated with the complex. 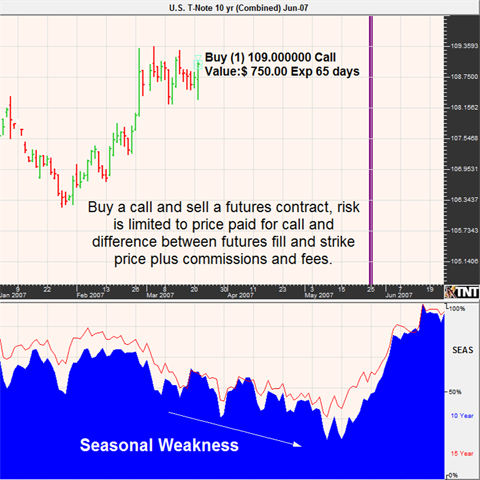 According to hypothetical values available to us, at the end of March a trader may have been able to purchase a June 2007 T-Note 109 call option for about $750. At that point, the option would have had just over 3 months of time value and provided a relatively lengthy and inexpensive opportunity to insure a short futures trader against an adverse price move in the futures market. In other words, a trader could have simultaneously purchased the call and sold a futures contract knowing that their absolute risk is $750 plus any difference in the fill of the futures contract and the strike price of 109. The same trader would be facing theoretically unlimited profit potential and three months in the market essentially worry free beyond the cost of the insurance (call option). With that said, in order for this trade to be profitable at expiration the futures price would have had to move enough in favor of the trader to overcome the premium paid for the option. In this case it is about 24 ticks. Assuming that the trader was able to sell the futures contract at 109 exactly, the profit zone would be at 108'08 (109 - 24/32). The payout of this trade at expiration may be identical to a long put option, but the flexibility provided to the trader is unmatched. Unlike a long put, a synthetic long put can be pulled apart prior to expiration in an attempt at capitalizing on market moves. Please note that doing so greatly alters the profit and loss diagram. The most important aspect gained from this article should be the idea that options are extremely flexible and can be combined in an unlimited number of ways in order to achieve a common goal. Which strategy to use depends on your personality, tolerance for risk and risk capital available.